Puff pastry stuffed with ground fresh meat, Chicken, Ham & Cheese and Spinach prepared at our premises. 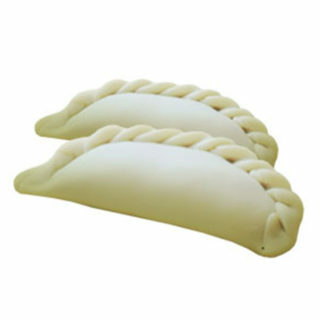 Take them home, keep them frozen and when you want to enjoy them, heat your oven to 450F put your “frozen empanadas on an oven tray sprayed with oil, beat an egg or two depending on the amount of meat pies you want to eat, and paint the top part of the empanadas with a brush. Now they are ready to be baked for 25 minutes.